Thomas J. “Bear River” Smith was shot down in the line of duty while serving as Abilene’s marshal. 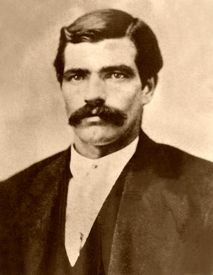 Thomas “Bear River” Smith served as a lawman in New York City, Bear River, Wyoming and Kit Carson, Colorado, before becoming marshal of the rough and tumble cowtown of Abilene, Kansas in June, 1870. Born in New York City on June 12, 1840, Smith grew up to be a middleweight professional boxer before joining the New York City Police force. However, after being involved in the accidental killing of a 14-year-old boy, Smith left the force in 1868 and took a job with the Union Pacific Railroad. His new position soon took him westward and he landed in Bear River City, Wyoming where he worked as a teamster. In no time, he utilized his boxing skills to gain a reputation as a tough man and he was soon appointed as the city marshal. However, trouble was brewing in the little city of Bear River after vigilantes hanged a murderer who worked for the railroad. Soon, the man’s railroad friends revolted against the vigilantes. Inciting a vengeful mob numbering in the hundreds, the lawless bunch torched town buildings and started a deadly shoot-out with citizens trapped in a storeroom. 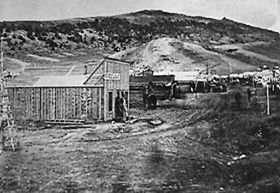 U.S. troops from Fort Bridger imposed martial law until the track-layers had passed. Bear River City soon became another railroad ghost town. From Wyoming, Smith moved on to Kit Carson, Colorado, where he held a similar position before making his way to Abilene, Kansas. In June of 1870, he was appointed the Kansas Cowtown’s first marshal, which was badly in need of law enforcement. He was paid a salary of $150 a month plus 2$ for each conviction of persons arrested. One of Smith’s first official acts was to ban all weapons in town without a permit. Within 48 hours, everyone had turned over their weapons to Smith, but he had had to knock down two thugs before they surrendered their weapons. Known as “No gun marshal,” he gained a reputation for subduing assailants with his fists rather than a gun, and where lawlessness reigned supreme, he was forced to often use them. The decision to ban guns was unpopular with some members of the community and during the next few months he survived two assassination attempts. On November 2, 1870, Smith rode his horse some ten miles outside of Abilene to arrest a man named Andrew McConnell, who was charged with murdering John Shea, a local farmer. However, when he arrived at McConnell’s home, telling him that he had a warrant for his arrest, McConnell shot Smith in the chest. Smith returned fire wounding McConnell before falling to the ground. McConnell’s co-conspirator in the original crime, a man named Moses Miles, then struck Smith with his gun, grabbed an axe and nearly chopped Smith’s head from his body. Thomas “Bear River” Smith was buried in the Abilene Cemetery, where his body remains today. The murdering pair of McConnell and Miles were soon captured and in March, 1871, both men were found guilty of murder and were sentenced to long terms in prison for their gruesome crime. Afterwards, the town of Abilene returned to its lawless ways until the next marshal could be hired – that of James Butler “Wild Bill” Hickok in April, 1871. Despite his reputation; however, Hickok did not do nearly as good of a job in the role as did Smith. 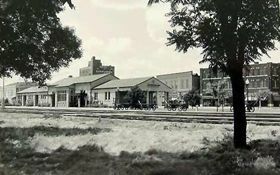 Abilene eventually settled down when new railheads were by built to Newton, Wichita and Ellsworth, becoming the favored shipping points.